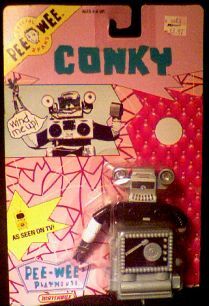 Four-inch tall wind-up figure of Pee Wee Herman's robot, Conky. Card still has original price sticker. Hey Conky, what's the secret word? Website design and hosting by Sohodojo Business Services. Item 278 of 466 items displayed in viewer. 0 items in cart.